One complaint about the current rise of the renewable energy sector in India is how it has sidelined the small and medium enterprises. As project capacities became bigger and auctions led to stiff competition, larger firms with access to cheaper capital and finance got the upper hand. Ten developers commissioned more than half of the capacities in the year to September 2018, according to calculations by consulting firm Bridge to India. 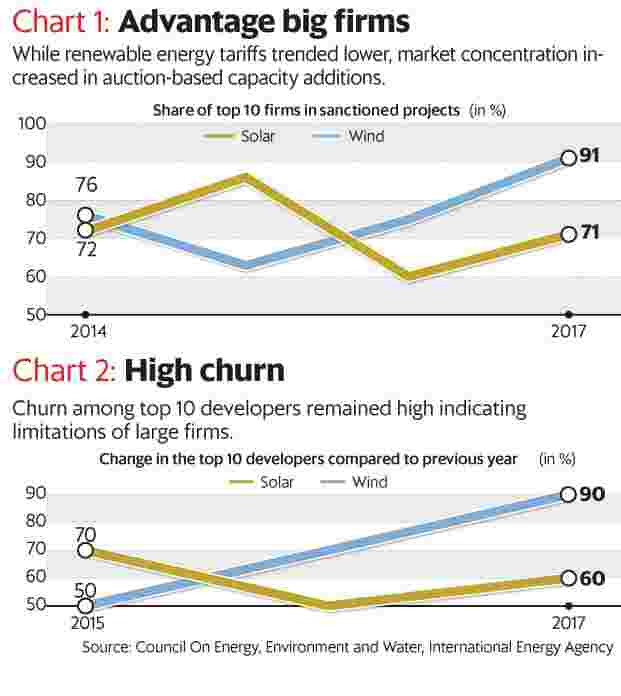 The share of the top 10 developers varies among wind and solar power, though both saw their share rise in the current auction-based capacity addition regime (see Chart 1). Nevertheless, an analysis by the Organisation for Economic Co-operation and Development, International Energy Agency, and Council on Energy, Environment and Water shows there is high churn among the top developers. The churn rate was as high as 90% in wind energy, and 60% in solar power last year, says the report, Clean Energy Investment Trends. “The relatively high churn rate is perhaps indicative of the limitations of the capacity of even the top firms to finance new projects every year, especially in the face of increasing market competition," it says. “In addition, firm-level portfolio considerations pertaining to the diversification of projects across locations and across off-takers could also have affected the bidding pattern of specific developers," the report adds (see Chart 2). The high churn rate could be a function of a young market with several entities competing to capture a growing share, said the report. Even so, some firms are clearly emerging as front runners. What’s more, the policy changes are deepening market concentration. As pointed out earlier in this column, import duties, cancellation of tenders, payment delays and threats to cap tariffs have impacted investor sentiment. This is raising the cost of capital as investors have to factor in a lot of risks now, Maxson Lewis, managing director of Magenta Power Pvt. Ltd, said in an interview recently. The phenomena will further sideline the smaller firms as everyone is not capable of raising low-cost capital, he added. The requirement, says U.B. Reddy, managing director and chief executive officer of Enerfra (India) Pvt. Ltd, a wind energy services provider, is to find a middle path where local investors are accommodated without hurting foreign fund flows. Encouragement to feed-in-tariffs at state level will help revive small- scale wind installations, he says, and adds: “It is unfortunate that the investors who have built the industry over the years are being left out." The challenge, as many are aware, is to arrive at a tariff which is agreeable to everyone. With tariffs in auctions seeing a steady decline, states are reluctant to commit on rates (tariffs). It’s time the industry and the Union government find a way out to reverse these pernicious trends.